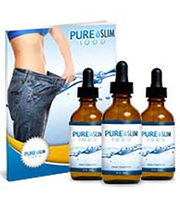 ﻿ Pure Slim 1000 Pills Review: Is it Safe? This liquid vial solution is intended to be more of a lifestyle change than a supplement, though they do claim big changes in weight loss are possible when done right. However the details surrounding this plan are far more interesting and deserve a fully loaded breakdown. That is why this review exists, to set aside the marketing and allow you the opportunity to decide between this and other weight loss brands. There is a recommended meal plan which notes all the foods which are allowed. However, the most important thing to realize is where the 1000 comes from. This is the limit of calories one is intended to eat daily while supplementing with the liquid vials. At 1000 calories deprivation surely one will lose weight, it just depends on how much willpower one has. The idea is that the ingredients found here will allow one to feel full of energy and without the need to go into the kitchen.Other less restrictive options for weight loss are here to make a difference. Included inside this brand are several amino acids which allow for protein to be broken down correctly. Of course a proper meal would supply the exact same properties. Looking at the ingredients is tricky as no label exists to show the exact amounts. Though becomes it comes in a liquid vial it has smaller amounts of ingredients. This includes African mango which is intended to control appetite. Glucomannan a fiber which stops food intake. Maca for libido and metabolism. Arginine which is found in sufficient amounts in foods. With several ingredients and some of which are good, it would seem to be positive. However because of the liquid solution only small amounts of each are given which is not enough to really satisfy the body's demands. Has some promising ingredients added. Caloric deprivation is really extreme and it is more of a lifestyle change instead of a supplement. Looking at the reviews it has been reported that many of the positive reviews are actually from the makers themselves. It might be true because the people who rated the product have a history of only reviewing this one product on the same day their account was created. On Amazon.com these people have no history to show how their past. Potential fake reviews and lack of strong ingredient strength are some negatives, however it still should be compared. See how this brand ranks amongst the very best. There is no doubt this product's strategy for weight loss will produce results. However the lifestyle recommendation of just 1000 calories a day would reduce weight in anyone no matter what you ate. It just is not enough food to carry a person. Sure there are a lot of ingredients but since it is manufactured in a way that limits its strength, it is far too weak to produce good results. There are far less restrict choices available to work with you not against. The diet plan will work, but it might not suit you unless you have the drastic overhaul needed. In order to secure functional weight loss there are alternatives with real reliable options. Take for example the elite level brand which fared better than most.